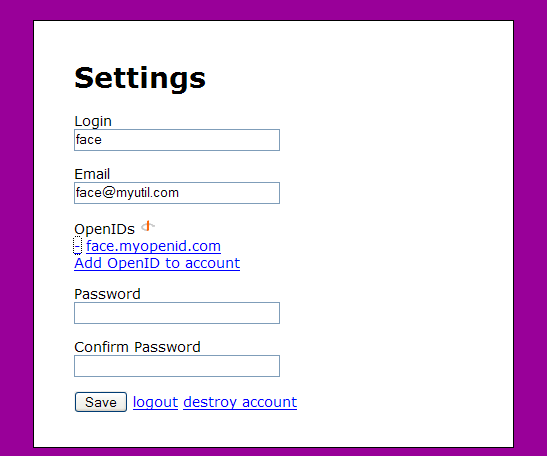 OpenID makes sense. Dr. Nick’s multi-OpenIDs per user example app makes even more sense. In the middle of integrating it into my project, gem-1.0.1 came out and broke ruby-openid-1.1.4. Dr. Nick’s great example no longer worked! A little digging and I found Dr. Nick’s example uses the standard open_id_authentication. That has a patch to work on ruby-openid-2.0.2 and rails 2 which can be found here. So in a nutshell, I grabbed openidauth_multiopenid-0.3.2 from Dr. Nick, removed a bunch of stuff from vendor plugins. Updated Rakefile, config/boot.rb, and config/environment.rb for rails 2.0.2. Patched vendor/plugins/open_id_authentication for ruby-openid-2.0.2. Regenerated db/migration/002_add_open_id_authentication_tables.rb. And installed ruby-openid-2.0.2 as a system gem. As a little code is worth more than a thousand words, here is Dr. Nick’s example application fully ported to rails 2.0.2 in ZIP and TAR.gz. For my port of Dr. Nick’s example above to work, you will need rails-2.0.2 and ruby-openid-2.0.2 installed as a gems. Security Update: January 4th, 2007 I noticed the example adds edit, update, and destroy to users_controller.rb using params[:id] thus allowing any logged in user to edit, update, and destroy any user of the system. To fix, simply change the first line of edit, update, and destroy to use the current logged in user (i.e. @user = User.find(self.current_user.id)).